This is awkward, to say the least. Columbia University offers a fellowship, launched in 1920, that can only be awarded to someone from Iowa?someone white from Iowa. To rectify this, the university is finally making changes to the Lydia C. Roberts graduate and traveling fellowship, which limits its recipients to the categories of Iowan and "Caucasian." According to the New York Daily News, Columbia filed an affidavit with Manhattan?s supreme court to get the restriction lifted. "Circumstances have so changed from the time when the Trust was established" that complying with the restrictions is "impossible," the Daily News writes, quoting the filing. 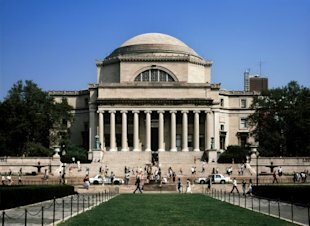 "Columbia University is now prohibited by law and University policy from discriminating on the basis of race." The money was left to Columbia by Iowa native Lydia C. Chamberlain, who died in 1920. The fund's administrator is now JP Morgan Chase. The fellowships have not been awarded since 1997, according to the Daily News, although it's unclear why. The white-only rule may violate the U.S. Constitution, adds the New York Post. But the fund, now up to $800,000, cannot be changed without going to court. The Post also notes that when the NAACP complained about the "whites only" clause in 1949, the provost at the time, Grayson L. Kirk, defended it as helpful to those who qualify. ?We do not feel we are justified in depriving some of our students of the benefits of restricted grants simply because they are not available to everyone,? he said, according to the paper. The Post also writes that when the scholarship was first awarded in 1920 it was for $750, easily covering the annual $180 tuition. In 2013, that same annual tuition is north of $45,000. The trust's bizarre restrictions aren?t limited to race and place, by the way. The Post adds that fellows ?must not study law or several other fields, and must return to Iowa for two years after graduating. ?